In case you haven’t heard or seen it, here’s a video of Thom performing the new song, “Lotus Flower,” last night at the Radiohead for Haiti benefit show in Los Angeles. 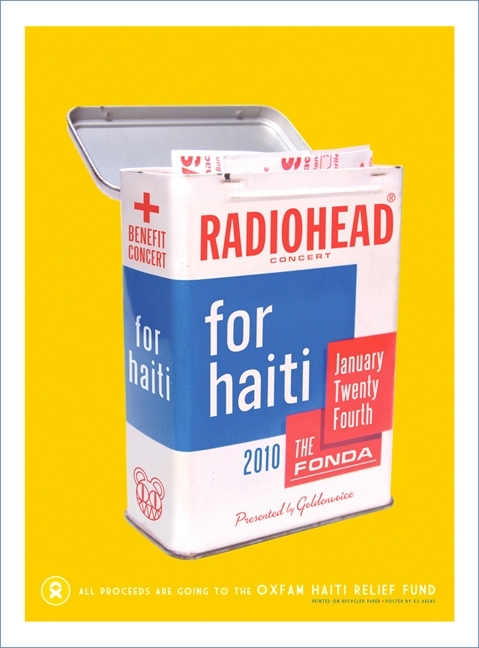 Radiohead performed tonight at Music Box at the Fonda in Los Angeles to benefit the Haiti earthquake which left the country devastated. Since tickets were auctioned off, the hope is that a lot of money was raised for the cause. Current reports are that around $572,000 was raised, with $2,000 being the highest ticket bid. About 1,300 people were in attendance, many of them celebrities as you would expect. Did you go to the show? If so, let us know your experience in the comments and gigography! We’re definitely curious about the new song that was played with the full band, “Lotus Flower.” This song was first played during Thom’s Eraser band show in LA last October. 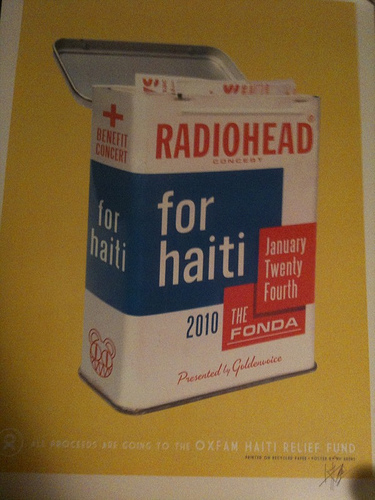 Okay, it’s been told to us that Thom performed “Lotus Flower” alone and not with the full band. 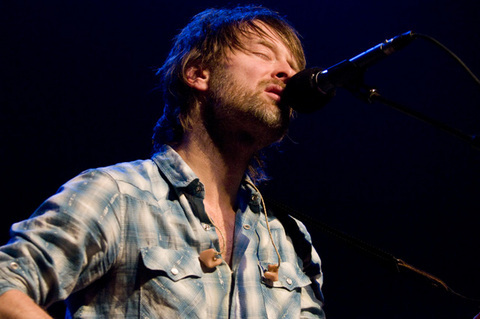 Thom is reportedly DJing the small afterparty. How fancy. Oh, and where can we get one of these badass gig posters like the one above? We’re in the middle of recording at the moment, so you’ll be catching us on the fly…. but if you’re up for it, then we are too. Well, that’s all clear now….